Every time you create a purchase through Quick Enrol, an invoice will be automatically created for you. Each item purchased will create an invoice line, so multiple students enrolling in multiple classes each can be recorded on a single invoice. An invoice is assigned to a debtor, so an employer requesting two students enrolling in three classes each can be issued a single invoice through one Quick Enrol process. Whereas two individual students each enrolling and paying for their classes themselves would be enrolled through two Quick Enrol processes, to create two invoices - one for each student. During the Quick Enrol process you can see the draft details the invoice you are creating, and add additional information like a customer's purchase order number or add additional custom lines, such as a surcharge for phone bookings. Invoice lines automatically created by Quick Enrol may include purchases of enrolments, products, vouchers or memberships. Full or partial payment against an invoice may be taken at the time of creation through Quick Enrol, or at a later date. A due date for the invoice can be manually set in Quick Enrol. These invoices are then visible within the Invoice list view. Like all other lists you can sort, search, export and print from this view. The invoice list view can be opened via Financial > Invoices. The quick search option in the top left hand corner of the screen allows you to search for invoices by debtor last name, company name or invoice number. When you begin typing the text into this field, the list of invoices shown will automatically reduce to meet your criteria. The 'Overdue' column will show the total unpaid component of the invoice that is due prior to tomorrow e.g. amounts due today, and in the past, which are unpaid are considered overdue. This updates daily, not in real time. By default, an invoices created by onCourse will have a due date of today i.e. their day of creation. If you wish to set a different default term for all your invoices, then you can set a 'default invoice terms (days)' in the Financial preferences, located at File > Preferences > General > Financial. This is a good choice for organisations who do not usually take payment upfront during the enrolment process. However, if most of your enrolling students require invoices with a due date of 'today', and some corporate contacts require invoices with due date terms, you can also set invoice terms per contact. In the contact record, open the Financial tab and unlock the default invoice terms. Replace the value with the customer specific terms. 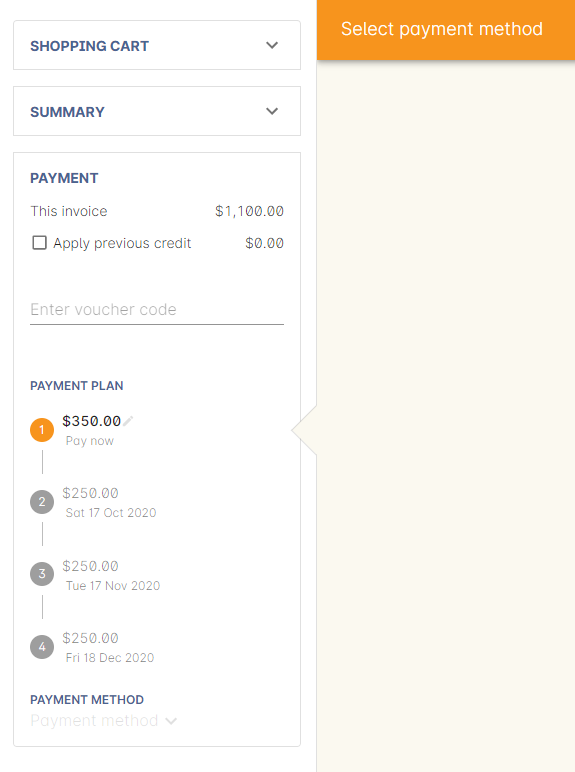 All future invoices created for this customer, including invoices created for enrolments processed over the website using a corporatePass, will have a due date set according to the custom terms. Invoices may not be deleted and all of the financial information within an invoice may not be edited once created - only the invoice due date and payment plan information can be changed. Although this may seem like an inconvenience, immutable invoices are extremely important to ensure a robust audit trail and to guarantee the integrity of the general ledger transactions. If you need to modify an invoice you should instead create a credit note. A credit note is an invoice where the invoice lines have negative dollar values. Remember if you are cancelling an enrolment or a class there are easier ways to do that from the class and enrolment list views. A credit note is an invoice with a negative total and is shown alongside invoices in the same list view. The owing amounts on an invoice and a credit note are not automatically zeroed against each other, however you can cancel them out by using the cog wheel option 'contra invoice'. You can apply a payment in for a specific invoice from the Invoice list view by highlighting a single invoice > clicking the cogwheel > selecting 'Apply payment in'. This will open the Quick Enrol screen with the contact field pre-filled and, provided the selected invoice is due on or prior to the current date, the highlighted invoice will be ticked within 'Payments'. If you select an invoice that has a due date beyond the current date, you will need to manually select the invoice to have the payment applied to in the Quick Enrol screen. The total payment amount will be auto-calculated to the balance of the selected invoice. You can apply the single payment across multiple invoices by selecting the invoices you wish to have the payment applied to by selecting them in the Payments tab on the quick enrol screens. 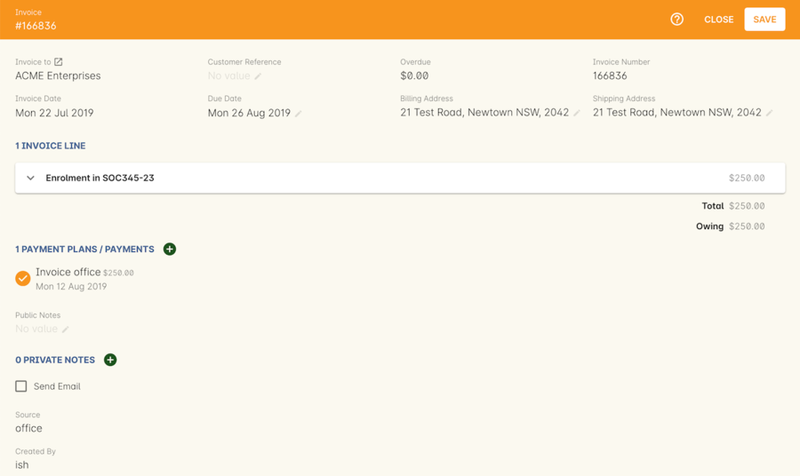 While you will usually create an invoice through using Quick Enrol, it is sometimes useful to create an invoice without an associated product or enrolment. 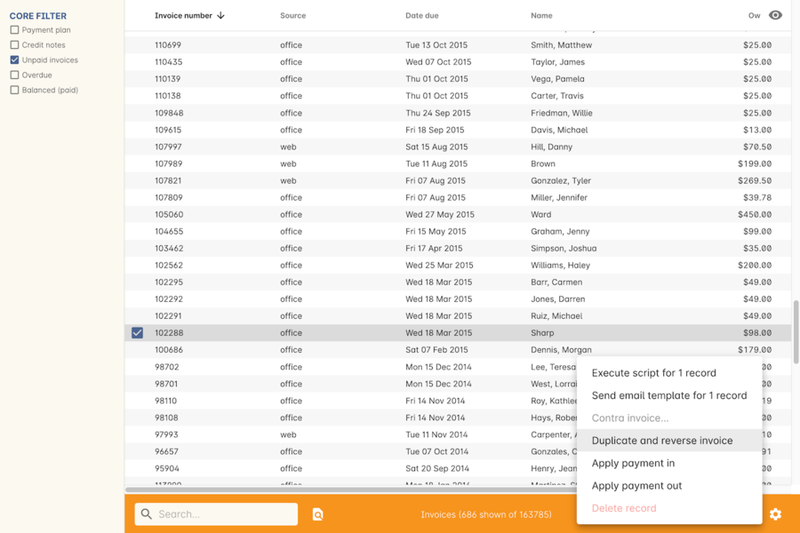 You can easily do that by opening the list of invoices and pressing the plus icon at the top right. Invoices created manually can have an invoice date in the past or the future, although the default setting is today. Invoices created with a date in the past will can be created prior to the financial period finalised date. They can only be created for unlocked periods. If you create a invoice in the past (or future) the general ledger transaction lines will be created for that date. You can not pay an invoice though that has a creation date in the future, as it doesn't yet exist with an outstanding balance. Remember to associate each invoice line with the correct income account code. Once you save the invoice you will not be able to change this code. Each invoice line can have a discount applied, and that discount can optionally be linked to a Cost of Sale (COS) account. If you do not apply the discount to a COS account, then the income value posted to the general ledger will be reduced by the value of the discount. By default, invoices are ticked to 'send email'. This sends the standard invoice email template to the debtor contact when you save the record. 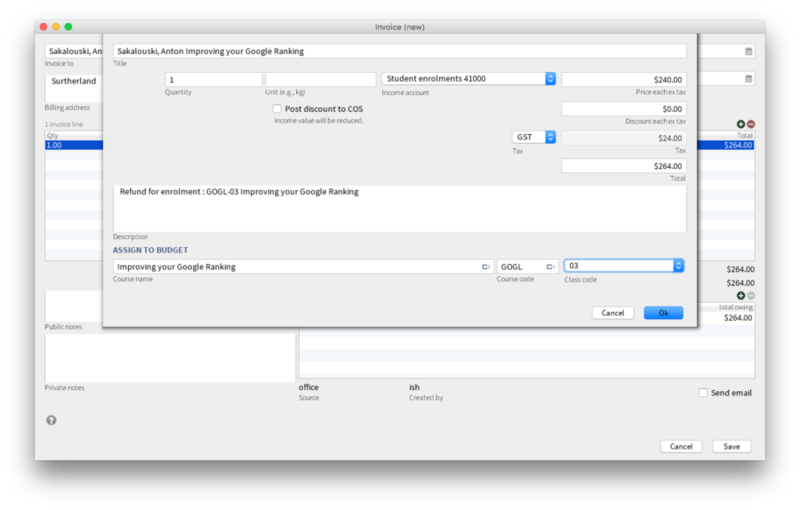 When creating invoice lines you may optionally link each line to a class. This will treat the income with the same general ledger pre-paid fees and income deferral plan as invoices created by enrolling in the class. This also adds the total of that invoice line to the class budget and can be very useful when invoicing a company for an entire classroom delivery without recording individual enrolments or need to include additional income such as funding in a classes budget. Type the course name or code, and select the class code from the drop down list to join a manual invoice line to a class budget. This feature is mostly used to create a credit note when you have cancelled the enrolment, but retained the invoice by mistake. These types of enrolments will have the status 'cancelled' rather than 'credited'. Alternatively, you might use this option to 'fix' the fee due post enrolment, if the student was charged the wrong fee during the enrolment process and you don't want to reverse the enrolment entirely. In this case, you would create a reversed invoice for part of the course fee. You can also use this process to reverse a credit note that shouldn't have been created. The reversal of a credit note will be an invoice. If you want to create a copy of an invoice, follow the same process by remove the minus signs from the invoice lines. Remember, you can't edit or delete 'mistakes' in onCourse invoices, but every invoice or credit note can be corrected by creating an equal and opposite reversal action. This tool is your shortcut to fixing those sorts of mistakes. This feature can only be used on one invoice at a time. 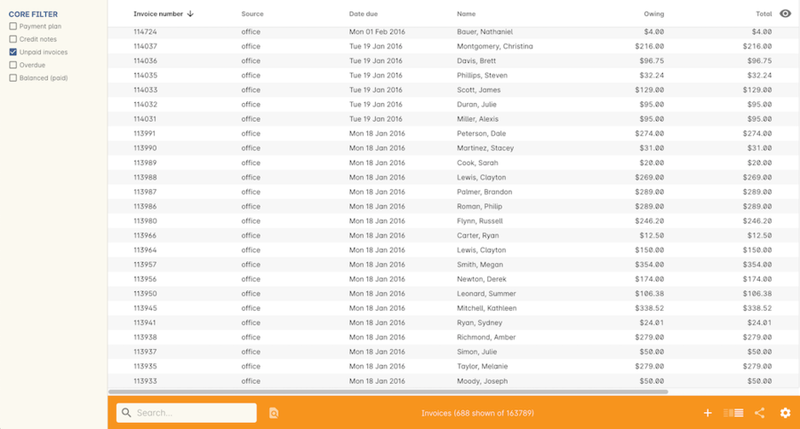 Open the invoice list view and single click on the invoice you want to fully or partially reverse. Click on the cogwheel and select the option 'Duplicate and reverse invoice'. A new invoice window will open. This will be a duplicate of the original invoice, in reverse. e.g. all the original dollar values will now have negative sign in front of them. You can edit the value of every field of the new invoice/credit note, including changing the value the reversal is for, to make it more or less than the original invoice value. Note that each invoice line from the original invoice will be reversed. You can delete invoice lines from this credit note you do not want to reverse e.g. if there were two enrolments on the original invoice and you only want to credit one. This reversed invoice has two invoice lines. Select one and click the minus sign (delete) button to remove it from the invoice. 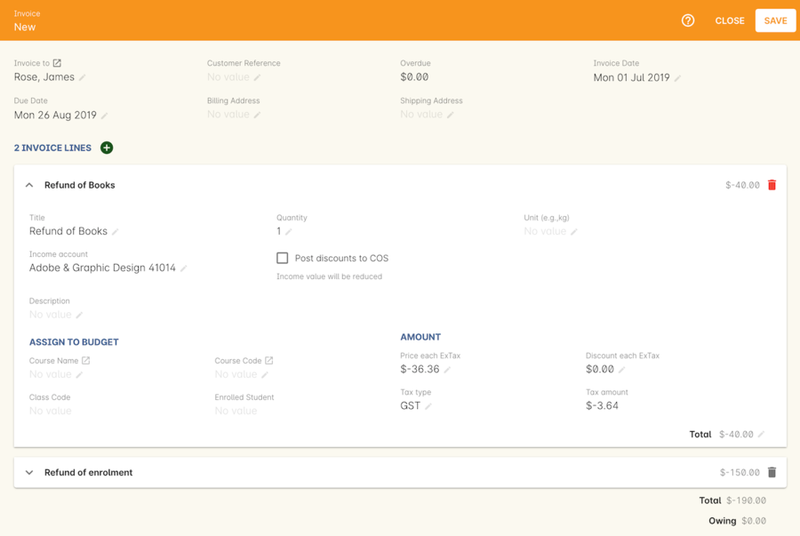 You can also add additional lines to the invoice, with either negative or positive values, for example, if you wanted to manually charge an admin fee, you can add the fee as an additional line with a positive amount. This will reduce the balance of the credit available to the student. If you want this new invoice/credit note to be applied to the class budget and pre-paid fee liability process, double click on each invoice line and manually link it to the course and class by code. 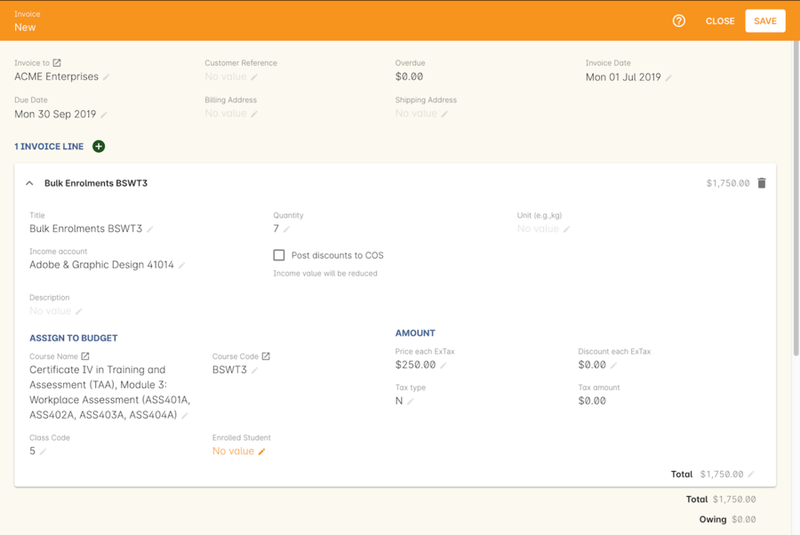 If this invoice reversal was for an enrolment, you will see the course and class code you need to manually reverse against in the invoice line description. By default, this new credit note won't be sent by email to the payer. Check the option 'send email' if you want a copy to be sent. Save and close the new credit note/invoice once you have confirmed all the values are correct. You can not change any of the data after you have saved it as all financial records are immutable. If you wish to use this new credit note to contra pay and existing invoice with a balance outstanding, select in the invoice list, and from the cogwheel choose 'contra invoice'. A new window will open allowing you to select unpaid invoices from the same contact you can credit against. By default invoices have a due of the day they are created. Sometimes you will want to allow students to pay for training over a longer period of time. Using payment plans you can set the amount of the up front deposit and a series of dates for payment of the remainder in instalments. An existing or new invoice can be converted to a payment plan by adding payment due dates. This can be done by firstly either creating a new invoice as mentioned in the section above 'Creating a manual invoice' just stopping before you click on 'Save', or opening an existing invoice. Then click on the '+' symbol at the top right side of the payment plans / payments table for as many different payment due dates you want to add. Once this has been done you can then start editing these payment plan lines starting with the dates you want the payments to be due. This is done by double clicking on one of the 'today' payment due date fields in the table and changing it to a date that you want the payment to be due by. Then do the same for the other payment due date fields until they are all setup correctly. Then lastly change the amounts that are due on each of these dates from $0 to your chosen amount. This is also done by double clicking on the relevant field in the table and editing the fee amount. It is important that the total of the payment plan amounts equals the amount owing; you will not be able to save the invoice unless they match. The 'Overdue' column in the Invoices list view will show the total unpaid component of the invoice that is due prior to tomorrow. You can edit the payment plan amounts and due dates at any time, for example if you grant the student an extension to the payment plan. 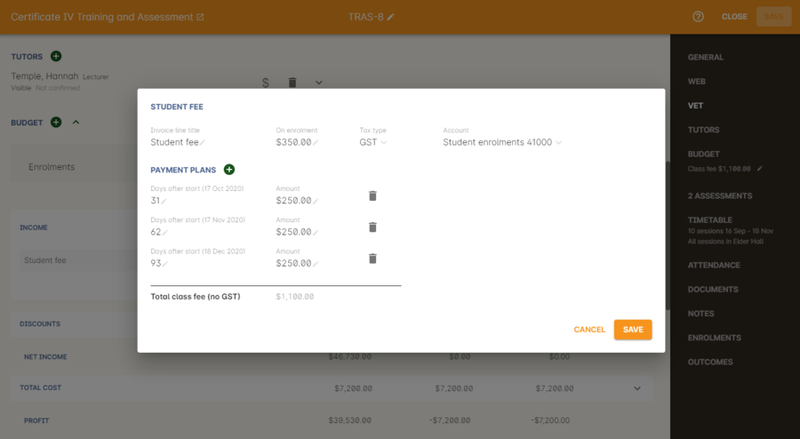 If you wish to offer a deferred payment scheme to all students in a particular class you can set up a payment plan templates from the class edit view you where you normally set the class fee. This can be quite useful if you an RTO who is bound by the Standards that limit your prepayment of fees to $1,500. For example, if you offer a 10-week course that costs $2000, the course costs $200 per week. Therefore, you could collect $1500 at the time of enrolment and the remaining $500 after week seven without needing to have any protection measures in place. You may also like to use payment plans as part of your online marketing strategy, by encouraging students to commit to enrolment early with a small refundable payment (say, $100), with the remainder of the fee becoming due on the class commencement. The payment plan template can include an amount on enrolment (deposit) and as many other amounts on dates relative to the start of the class. If you subsequently adjust the class timetable and change the class start date then the payment plan template will automatically be adjusted. When you duplicate classes the payment plan template will also be adjusted with the new timetable. To create a payment plan for a class where the fee has already been set, you may wish to click the lock icon next to the class fee first. This will ensure the payment plan adds up to the existing class fee, rather than add additional costs to the class fee. The 'on enrolment' fee will auto adjust to the amount remaining. 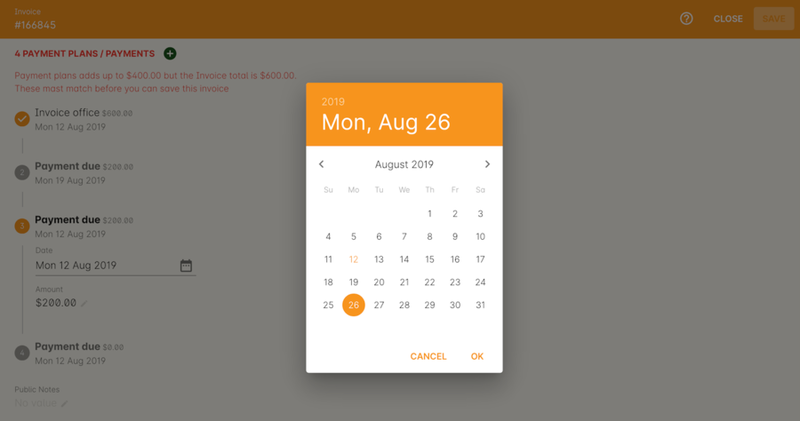 Each payment line you add requires an offset date from the class start. This offset can be positive (days after) or negative (days before). The actual due dates for the payments for this class will be calculated and shown in the payment plan screen. During enrolment info a class with a payment plan, only the deposit amount will normally be charged at enrolment. The payment field will auto adjust to this amount, but you can manually alter it to be more or less as you need. If, at the time of enrolment, the next payment dates have already passed those amounts will also be charged. So, let's take an example class with a $1000 deposit and $500 due 7 days before the start of class. A student enrolling 10 days before the class starts will be charged $1000 and a student enrolling 5 days before class starts will be charged $1500. During Quick Enrol every involvement with a different payment plan will be added to a separate invoice. In this way a single Quick Enrol process may generate two or more invoices. If several enrolments have an identical payment plan, then they will end up on the same invoice. If a payment plan applies to the class, we suggest you make some note of it in the class web tab, so a potential student enrolling via the web can see what amount is payable and when. The full class fee will still display in the class block when a payment plan applies. When the student completes the enrolment process, the 'pay now' component will be reduced to the deposit payable. The invoice the student receives on completion of the enrolment process will itemise the remaining payment components and their due dates. 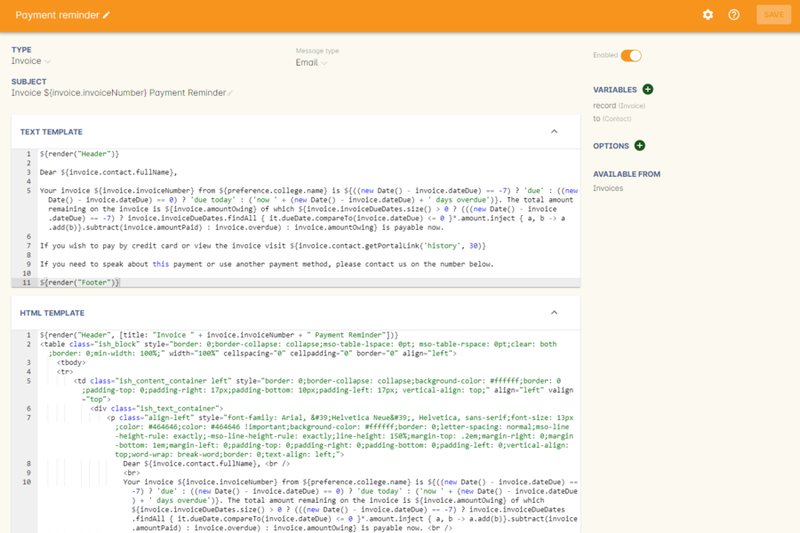 If you have payment plan templates to create for very many classes you may wish to instead use a script to automate the process. A simple script might identify all classes with a fee over $1500 and then limit the amount due on enrolment to $1500 with the remainder payable over the duration of the class. More sophisticated payment plan scripts can create different plans depending on the duration of the class, the amount of the fee, whether the class is VET or not and any other criteria. When a student is on a payment plan, you may wish to enable the default system script 'send payment plan reminder' so the debtor is automatically emailed a reminder 7 days before their payment is due a link to make the payment via the skillsOnCourse portal. You can enable this from the top menu by going to File → Preferences → Scripts, then double click on the script 'send payment plan reminder', click on the checkbox 'Enabled' in the top right side of the window, then Save. This default reminder will also send overdue notices to any debtor who has an invoice (on a payment plan or otherwise) where the payment is overdue. 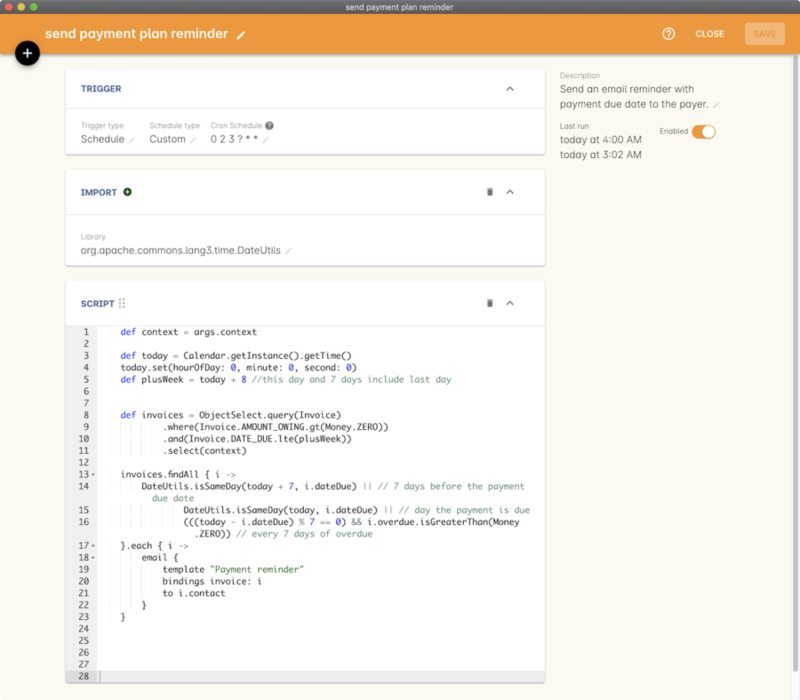 This script will trigger the email template 'Payment reminder' which can be edited by going to File → Preferences → Email Templates, then double click on the email template 'Payment reminder'.